I am a Canadian-born interdisciplinary artist currently living and working in Brisbane, Australia. I am a ceramicist, an illustrator, as well as a weaver. I completed my Bachelor of Visual Arts with First Class Honours at Sydney College of the Arts (SCA), The University of Sydney in 2007. This is how I met my better half, Corey. We majored in ceramics together at SCA. We moved to Brisbane when I fell pregnant with our daughter Charlotte, to be closer to Corey’s mother in the Northern Rivers of NSW. We both work full-time jobs, and teach private pottery lessons on the weekend. We create with every quiet moment we have. I hand weave spiritual pine needle baskets, inspired by my North American Métis background on my mother’s side, and by my beautiful mother-in-law Georgia, from the Native American Nez Perce people. 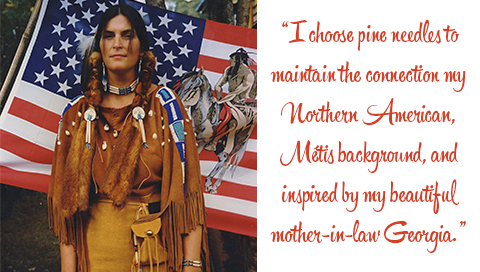 I choose pine needles for this reason; to maintain the connection with my Northern American, Métis background. Their smell reminds me of home. I have always been fascinated by Native handwoven crafts and arts. I was taught a few different hand-weaving skills using natural fibres at an early age on school excursions around Alberta, Canada at Niitsitapi reserves and Pow Wows. My passion reignited after my beautiful mother-in-law Georgia passed away unexpectedly in 2012. I was given her kindle, which was filled with books on Native American basketry, art and spirituality. 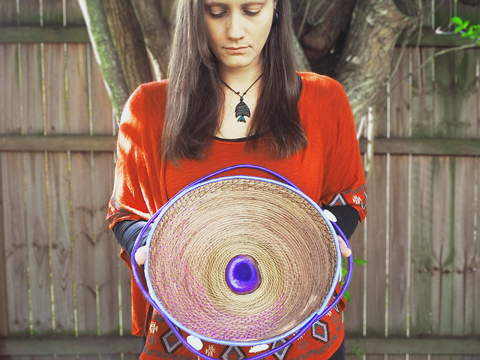 This is when I began weaving again after taking some time away from work, as well as my art practice, to look after our other creation – my beautiful daughter Charlotte. We make most of our work in our ceramic studio, downstairs underneath our big Queenslander. We cherish our afternoons spent downstairs being creative in the studio with the radio blaring, Charlotte in a warm bath in her little pool, and Mordecai – our rescued Magpie – hanging around with his two young spring chicks and better half Margaret in the yard, often poking their heads in to say hello and sing us beautiful synchronised songs. 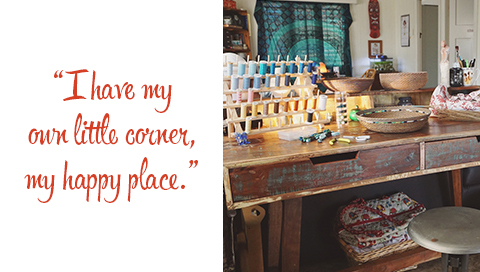 I also have my own little corner in the lounge room behind the “L” shaped couch facing the TV, where I spend my evenings sitting at my new rustic wooden art desk, weaving baskets. This is my happy place. 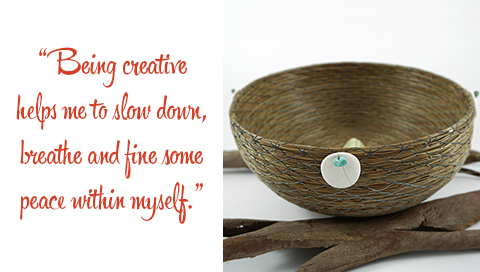 I have suffered from anxiety most of my life, and being creative is one of the few mechanisms which helps me to slow down, breathe and find some peace within myself. I need to keep my hands busy because if I am not being creative, I feel week, bored and useless. 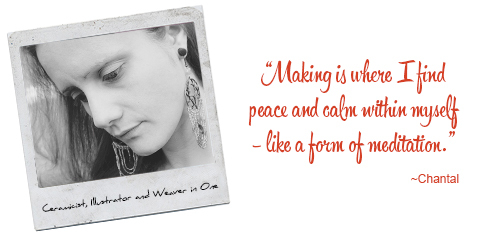 I lose myself in the process of making; it is in the many laborious processes of making where I find peace and calm within myself – like a form of meditation. 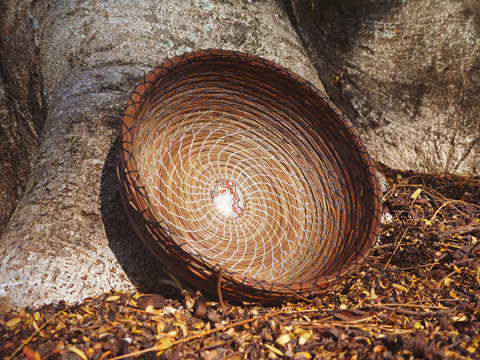 In the process of basket making, the act of gathering and the preparation of materials is just as important as the making itself - I also find peace in nature. I collect pine needles from all around the Northern Rivers of New South Wales, and also the Southeast Queensland regions of Australia. I find value in using materials collected from my immediate surroundings. Each material has its own marvellous personality, its own shape, uniqueness and purpose; its own significance. After they are collected, the pine needles are then prepared and washed thoroughly in boiling water so they are free of dirt or other organic matter. Each pine needle is then carefully handpicked, the best chosen to be woven into each basket. I joined Made It in January this year because I wanted an online space where I can showcase by handwoven work separately to my ceramic practice. I am still progressing through building stock to fill my new shop. Over the past few years, I have been asked to weave many personalised baskets for a number of people – often as gifts for loved ones. 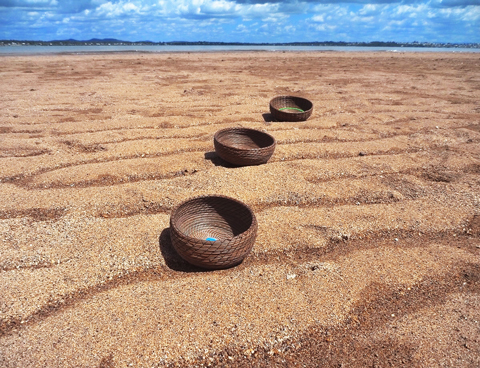 Each basket is completely unique, each has its own story to tell, and no two baskets are ever the same. 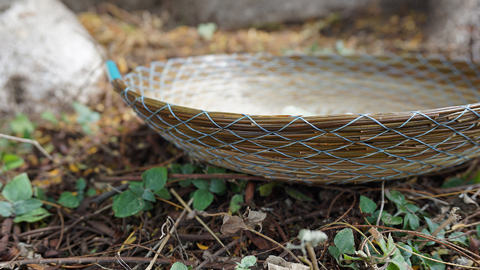 I can personalise handwoven pine needle baskets in 5 different sizes. An example of how I have personalised a basket is one of my latest baskets titled "May Flowers", named by my sister-in-law Megan, a gift for her Grandmother May. 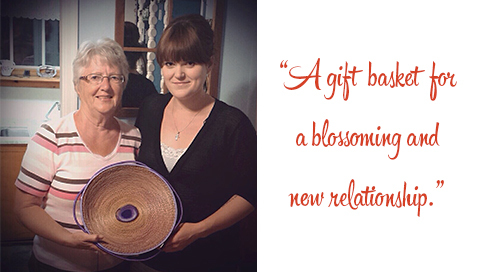 Megan approached me last year to weave her a special personalised gift basket for her Grandmother, whom she has only recently begun to form and strengthen a relationship with. With a long distance between them across the vast Canadian landscape, Megan grew up with her Grandmother on the opposite coast, barely knowing her. Megan chose the stone - she was very certain about it the moment she saw it. Woven in the heart of her intricate healing basket is a large beautiful piece of pink, plum and purple-laced agate. Agates are believed to be grounding stones aiding in centering and balancing positive and negative energy. Its healing properties include harmony, strength, and courage. A soothing and calming stone, it works slowly to bring great strength to the heart. Pink, plum and purple-laced agate are also believed to strengthen the bonds between parents and children (in this case, Grandparents and Grandchildren). A gift basket for a blossoming and new relationship. I do dream of a world where all artists and makers can make a living from their practice. We are a consumerist society, full of manufactured and mass produced “cheap” goods, however, I do feel that there is a growing number of people who are more conscious of what they buy, where it came from, how it was made, what it was made out of and also who made it. Artisans often do not pay themselves adequately for the time, effort, and love they put into a handmade piece because they are trying to compete against mass-produced goods. I am guilty of this. If we were to pay adequately ourselves for our time (not to mention all the failed attempts at trying to develop something), then the price would become unaffordable to the every day. 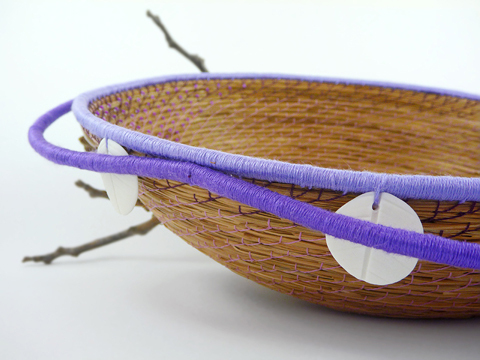 What I love about Made It is that it is a platform solely for the handmade (I get lost in the vortex scrolling through all the wonderful work) and is an opportunity to showcase my basketry independently to all my other work. Most other selling platforms around are too broad and general now, it is hard for the handmade to get noticed, and it is also impossible to compete against mass-produced manufactured goods. I hope that Made It remains purely handmade, and look forward to seeing all the new wonderful creations!